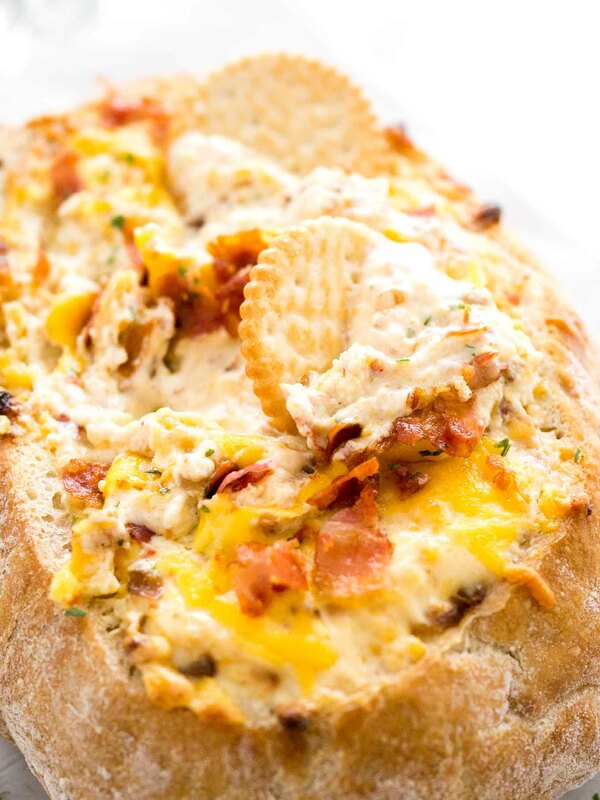 This Cheesy Bacon and Caramelized Onion Dip is sure to be a huge hit at your next party! 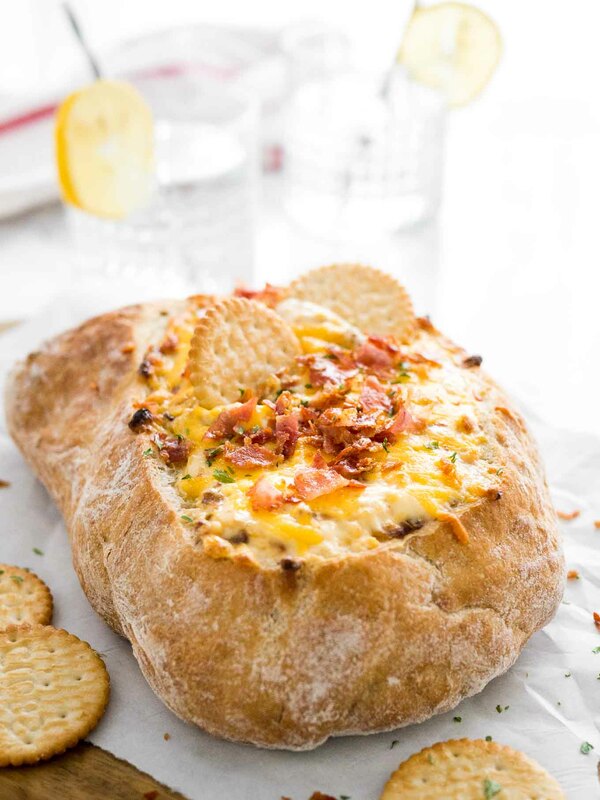 A hot, creamy dip made with sweet onions, crispy bacon, and cheese that is so fast to make. 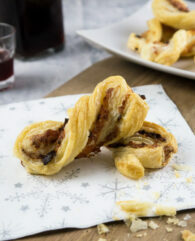 It’s creamy, it’s hot, it’s cheesy and loaded with crispy bacon! 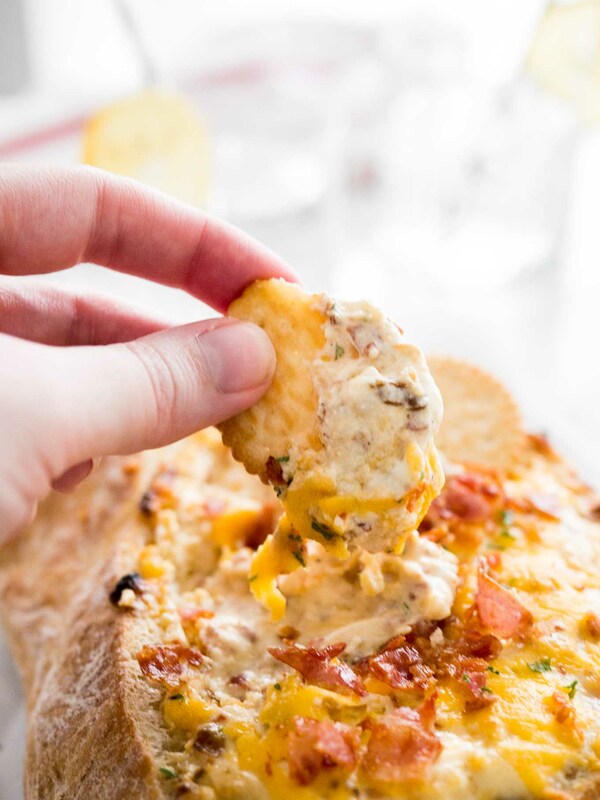 This Cheesy Bacon and Caramelized Onion Dip is highly addictive and so easy to make. It comes together in a matter of minutes and then bakes in the oven for 20 minutes until it’s bubbly and creamy. 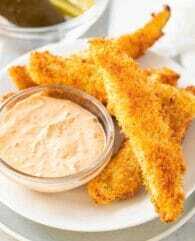 A great party appetizer that’s sure to be a crowd-pleaser at your game day party or family get-together! 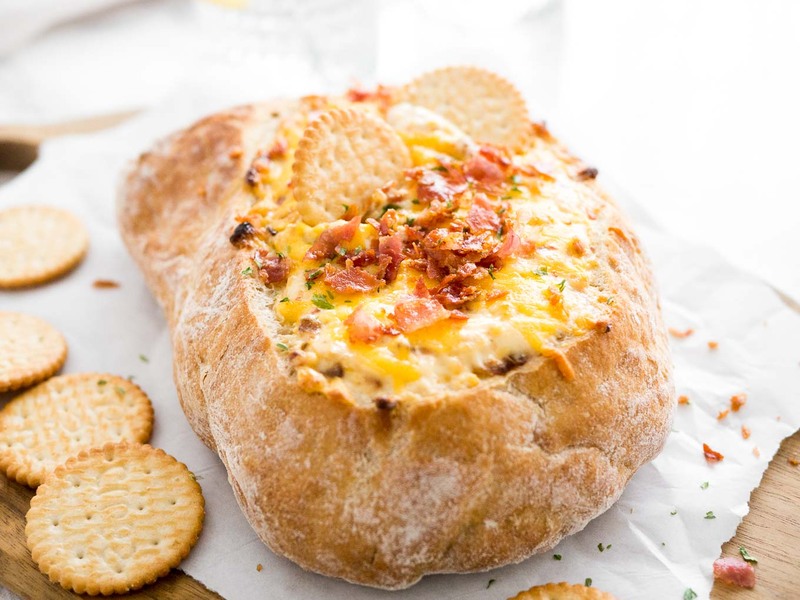 You could surely serve this dip in a normal baking dish but serving it in a bread bowl is more fun, makes clean up easier (really important for me!) and everyone will fight about the delicious dip-soaked bread. It’s incredibly good! To be quite honest with you I’m not the biggest onion fan. Raw onions and I are not the best friends! My hubby always has to eat the onions from my burgers, not that he complains but some places really overdo their onion-game. 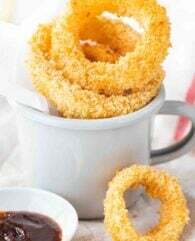 But there are also some onion things I really love: Fried onion rings, crispy onions like the ones you put on your hot dogs at IKEA, and caramelized onions! Caramelized onions are one of my favorite ways to eat onions, they’re so good. Soft and sweet! That’s how I like my onions! 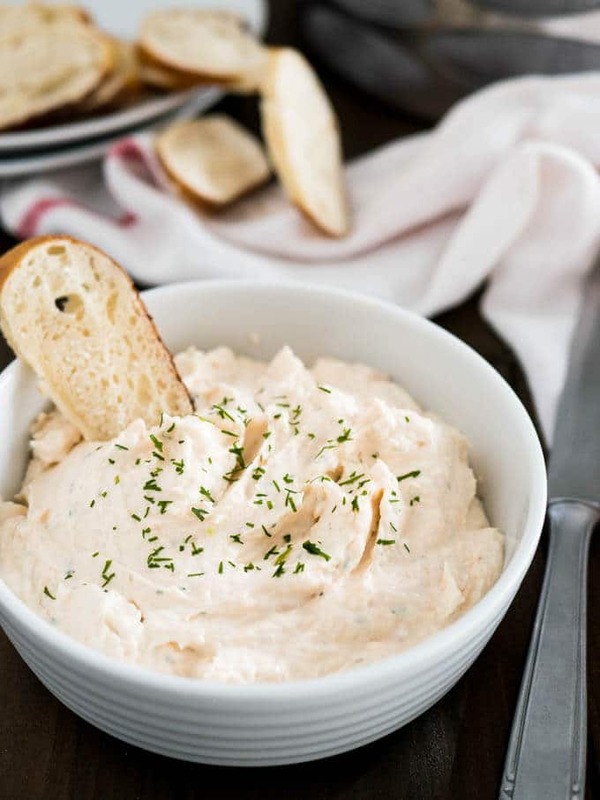 Adding those sweet, caramelized onion to a creamy, cheese dip makes it dangerously amazing! All you need to do to make this dip is caramelize some onions while you cook the bacon in the oven. Making bacon in the oven is the easiest way to get crispy, delicious bacon without the mess (and you’ll need the oven to ‘cook’ the dip anyway!). Mix everything together and spread it in a baking dish or in a bread bowl. Sprinkle cheese on top and bake for 20 minutes. 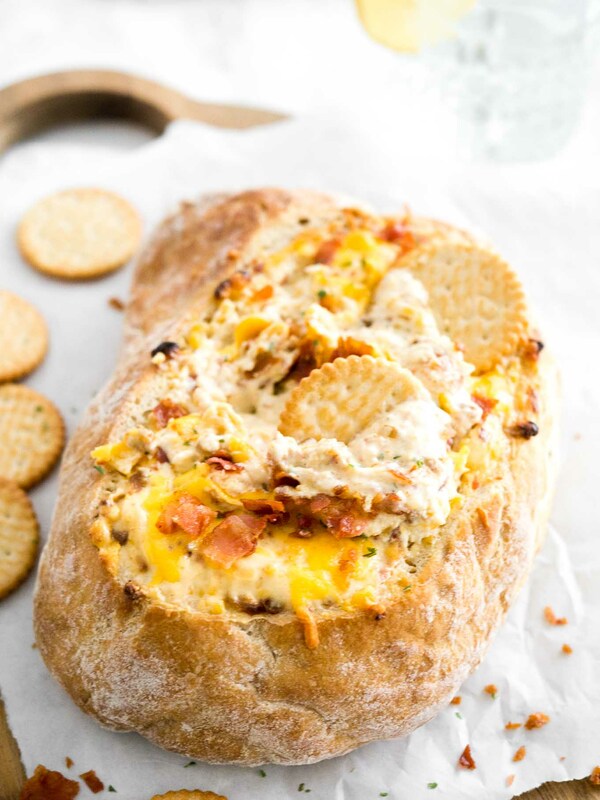 So easy and you’ll be rewarded with a perfect creamy, cheesy dip loaded with yummy bacon and caramelized onions that is every snack lovers dream! Preheat oven to 350°F (180°C). 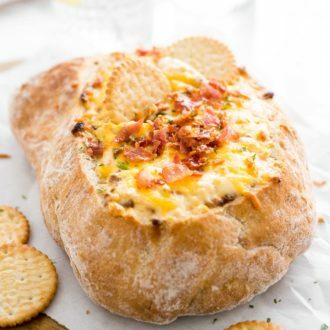 You can make this dip in a baking dish or in a bread bowl. In a large bowl combine bacon, cream cheese, sour cream, Worcestershire sauce, caramelized onions, and 3/4 of the shredded cheese. 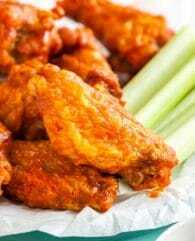 Season to taste with kosher salt and black pepper. 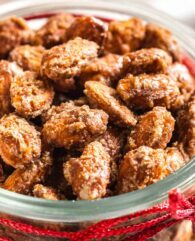 If making this in a baking dish: Spread into a baking dish, sprinkle with remaining cheese. If making this in a bread bowl: Use a knife to cut a circle on the top of the loaf then remove enough bread to make a bowl. 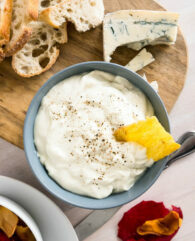 Spread the dip into the bowl and sprinkle with remaining cheese. Bake for 20-25 minutes until bubbly and golden. Serve warm so it's nice and creamy. To make crispy bacon: Preheat oven to 400°F. Line a baking sheet with aluminum foil and arrange the bacon in a single layer. 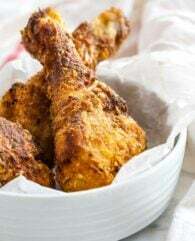 Bake for about 12-20 minutes or until golden brown and crispy. Cooking time varies depending on the thickness of your bacon. Place cooked bacon on paper towels. To make caramelized onions: Place a skillet over medium heat and melt one tablespoon butter. Add about 1 cup diced onions to the pan and stir gently to coat with butter. Check the onions every 5 to 10 minutes. When the onions are golden and smell caramelized deglaze the pan with one tablespoon of water.